A Community Development District 6 supervisor on Friday called for Villagers to keep their lampposts illuminated at night. A new Wendy’s restaurant is on track to open this summer at Trailwinds Village on County Road 466A in Wildwood. When Wildwood's new police chief came on board, he quickly noticed that officers had been allowed to choose their own attire. It resulted in a mix of odd-looking officers. The Timucua Chapter of the Colonial Dames of 17th Century will be presenting a historical marker at the 130-year-old Baker House in Wildwood on Saturday, April 27 at 10 a.m.
An 84-year-old Spruce Creeker was caught up in a lottery scam recently, which prompted his attorney to send a letter to Marion County Sheriff Billy Woods. Ocala Health has announced plans to bring emergency care to Sumter County with the opening of a freestanding emergency department. A Village of Gilchrist resident contends it is time to stand up to the Sumter County Commission. She urges her fellow Villagers to attend an upcoming meeting. A Project Wide Advisory Committee member argues that the body did not have the authority to vote to eliminate the cap on amenity fees. He says an important meeting is coming up and residents need to attend. Read his Letter to the Editor. A Village of Alhambra resident, in a Letter to the Editor, has a message for “sympathetic” supervisors in the case of a veteran in The Villages. A little slice of paradise in The Villages is the perfect spot to relax and enjoy the sunset. Nest watch continues for the great horned owlets in The Villages. You don't have to go far to see beautiful sunsets... you can find them right here in The Villages. A great photo showcasing the beautiful bald eagle in The Villages. Check out this adorable sherman fox squirrel spotted in The Villages. The bottlebrush bush makes a nice resting spot for this little palm warbler. Cornerstone Hospice has named a new executive director for the Lake and Sumter County region. For all of our premium email subscribers receiving a newsletter from Villages-News.com, you will now be able to manage your email subscription from a central dashboard on our website. Read more and register. A new organization looks to offer a fitness program for dogs and their Villagers soon. We've got more information. A review of health inspection records shows that a new manager hired to clean things up at Cody’s Original Roadhouse at Brownwood was dogged with dirty reports within days of his hiring. Mammograms will be much more comfortable with high-tech equipment boasting 3-D technology. The Villages Musical Theater’s latest production, “South Pacific,” recently enjoyed a sold-out, four-performance run at the Savannah Center and raised thousands of dollars for MS research. Villages-News.com theater critic Donald Simson reviews the Bay Street Players' production of "Greater Tuna," which tells the humorous tale of a sleepy little town in Texas. A salute to the glory days of radio, from 1939-45, is coming to the Bacall Recreation Center. The Belvedere Executive Golf Courses will be closed for single day aerification, sanding and chemical applications. We've got the dates. 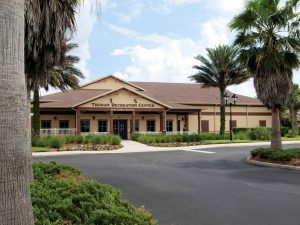 The closing of five executive golf courses in The Villages has been announced. Sandy Lang scored a hole-in-one April 11 on Hole #2 at Pelican Executive Golf Course in The Villages. Nearly 100 golfers participated in the 12th Annual Military Officer's Association of America Golf Tournament this week. We've got the winners and results. The Bunnings have been crowned as the champions of the Restricted Bat League’s Winter 2019 season in The Villages. The Bogart and Mangrove Executive Golf Courses will close until further notice for early transition repairs and recovery. A driver was airlifted early Thursday morning from the scene of a crash that shut down U.S. Hwy. 27/441 near RaceTrac in Lady Lake. A Villages couple has won permission to remove two Live Oak trees from their yard. Someone who rented a 2017 Yamaha golf cart has failed to return it to The Villages Golf Cars. The VHA has honored the Day-Break Club of The Villages with its 2018 Volunteer Organization of the Year. Johnny Rockets at Lake Sumter Landing was packed Wednesday night with Villagers and their guests to support the Florida Sheriffs Youth Ranches programs. The book room at Goodwill’s Oxford store has been named for Adam Hanson, a young man who died in a 2006 motorcycle crash. Two homeowners pleaded for permission to get rid of problematic oak trees at their homes in the Village of Mallory Square. A homeowner in The Villages has won permission to stray from the approved color palette for an upcoming re-painting at his residence.